Annually, Franklin County residents and businesses send over a million tons of material to the Franklin County Landfill. Even more surprising is that nearly 70% of all the material in the landfill could have been recycled or composted. 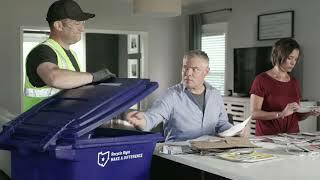 By taking just a few minutes to recycle right, you help to reduce pollution, contribute to clean water, conserve limited natural resources and reduce central Ohio’s reliance on landfills. It’s time to throw out bad recycling habits. It’s not enough just to recycle. It’s also important to recycle right. In Franklin County, there are five material types that are currently accepted for household recycling. Keep items loose; don’t bag them. Everything else should be reused, donated, composted or disposed of safely. Recycling is easy, don’t make these common mistakes. Plastic bags are not recyclable in the curbside or drop-off program containers. They can be recycled at more than 100 retail locations in Franklin County. Use the Recycle and Reuse Search Tool to find a location. Tanglers can cause big problems at the recycling facility. Find recycling opportunities by using the Recycle and Reuse Search Tool to look up specific items. Carry out food containers are not accepted in curbside and drop-off recycling because they typically contain grease or food residue or the material the container is made of isn’t accepted. Compact fluorescent light bulbs should be recycled at SWACO’s Household Hazardous Waste facility or at the many hardware stores that will accept them. Use the Recycle and Reuse Search Tool below to find a location. Other types of light bulbs can be disposed in your trash. Coffee, party cups, and other disposable cups should be reused or disposed in the trash. Yogurt containers are only accepted as part of the nationwide “Gimme 5” program available at Whole Foods. Use the Recycle and Reuse Search Tool to find a location near you. Styrofoam is not accepted in curbside and drop-off programs and should be disposed in the trash. Local recycling facilities are designed to accept only certain plastic items such as bottles and jugs. All other plastic items should be reused, donated, or disposed in the trash. Needles and other medical waste create serious health dangers for recycling workers and should never be included with your household recyclables. These items should be placed in a sharps container and disposed in the trash, or taken to a publicly available safe syringe disposal box that can be found using the Recycle and Reuse Search Tool. Batteries can cause fires and should never be included with recyclables. Some rechargeable batteries can be recycled at hardware stores. Household batters are accepted at SWACO’s Household Hazardous Waste facility. Alkaline batteries may be put in the trash. These items should be placed in your household trash. Putting unaccepted items into your recycling container can cause delays, put recycling workers at risk, and add expense to recycling. Need to dispose of one of these items? We’ve got you covered. Find out what to do. Want to know more about the recycling process? Watch This Video From A Local Recycling Facility. Interested in visiting Rumpke’s Columbus Recycling Facility? You take out the bins. We'll take out the hassle. In Franklin County, curbside recycling service is available to over 96% of households and SWACO operates over 60 recycling drop-off location for residents and businesses without recycling services. To find information about a curbside program or find a drop-off location close to you, see the links below. Learn about what’s recyclable, why, and how to Recycle Right. Learn how! Looking for a recycling drop-off site in your area? Use our search tool. How much do you know about recycling? Test your knowledge and share your results with friends! How can you give your recyclables a new life? By putting your recyclables in a recycling bin or recycling location, you can give them new life. For example, what happens to a plastic bottle after it leaves your home? Plastic bottles are collected along with other recyclable items such as cardboard, glass, and aluminum cans. Once collected, the recyclable materials are delivered to a recycling processing facility, sometimes called a "material recovery facility" or MRF. At the MRF, the recyclable materials travel on a series of conveyor belts and are separated using a variety of technologies such as screens, electro-magnets, and human sorters to separate the material into different material types. Once plastic bottles are separated from the other materials they are compressed into bales that are sold and shipped for further processing. The different types of plastic used in bottles and their caps must be separated. This can be done by chopping the bottles (with caps) into small flakes and placing the flaked material into a tank of water. Since the plastic in the bottle and in the cap have different densities, the bottle pieces sink in water while the cap pieces float, which separates them for recycling. The dried plastic pieces are now heated into a gooey liquid and “extruded” into long, tubular strands. The strands are cooled and hardened in water, chopped into pellets the size of split peas, and shipped to companies that make a variety of new recycled plastic products. Plastic bottles can be recycled into durable backyard decks, carpeting, new bottles, or even soft, comfortable fabric used for fashion or upholstery. Bottle caps can become tough kitchen bowls and cutting boards, car battery cases, toothbrushes, and storage bins. Start giving new life to all your recyclable materials. Learn about where you can recycle your items and how recycling makes a difference in our community. Have a question about what’s accepted or not accepted for recycling in Franklin County? Visit our Frequently Asked Questions page. Our Recycling and Reuse Search Tool connects you with hundreds of locations to find the best place to donate, recycle, compost or safely dispose of a wide range of items.